… to feed the poor? Geez, I used to say that myself in my former life as a Protestant – when I was an anti-Catholic. Actually, if you added up all wealth and property of the Protestant churches and organizations it would FAR exceed that of the Vatican or all the individual dioceses around the world! Since it is often Protestants who make this challenge, do they ever suggest Protestants should sell all their land, buildings, pastors’ fancy cars and the mega-church $ millions? Most people don’t realize that most of the Catholic Church’s “wealth” is in property, hospitals, schools, social services and churches. We are the largest health care provider in the world. To learn more about this, watch the fantastic video put out by www.CatholicsComeHome.com here. Click on “Epic Commercial.” This video make me PROUD to be a Catholic! But, should the Catholic Church sell everything to feed the poor? No, first it shouldn’t and second it can’t. To find out why, read this article from Zenit (provided below). It was written several years ago but it is the same cogent argument and needs to be repeated often. VATICAN CITY, (Zenit.org).- The proposal of a member of the social networking Web site Facebook suggesting that the Vatican should exchange its treasures for food in Africa is an impossibility due to international law, says Cardinal Paul Josef Cordes. “Going once, going twice…sold! 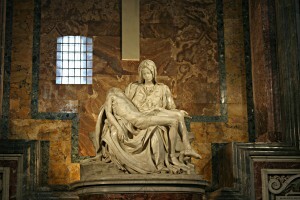 How much for this Pieta? The prelate recalled an incident in the 1970s when a benefactor made a donation to renovate the Collegio Teutonico inside the Vatican, and the residence director wanted to give this person a small statue — of a meager value compared to the others in the Vatican Museums — as a gesture of gratitude. The German benefactor had a lot of problems with the Italian state, as he was accused of taking goods that Italy was charged with safeguarding. “In every country there are a lot of measures for the defense of works of art, because the state has a duty to maintain them,” Cardinal Cordes added, noting that the Holy See treasures are also part of Italian cultural history. The Cor Unum president underlined the work of the Catholic Church in health services and education in various regions in Africa. “When they come to meet the Pope, the African presidents recognize this,” he said. I just tell them that all the Church’s assets would equal what the USA spends on armaments in a long weekend. Just don’t want to forget about the most valuable of the Church’s treasure! It was estimated that if the Catholic Church were able to sell everything it had, and give the money away, everyone in the world would get exactly 2 dollars. So a better question would be, what are we doing with our $2?…..Buying a cup of coffee, or giving it away to the poor? Im Christian (born-again persuasion) raised Catholic…have been so blessed with Both sides of the same coin…that Jesus is our Lord. In that, I do wish unity among the brethren. Selling church assets to feed the poor? How bout everyone giving up one Starbucks a month. Im sorry–just some things seem trivial. Jesus has come that we might have life and life abundantly! The Church assets are true history to be enjoyed by all for as long as they exist. Why not ask the Louvre to sell all art or ask that of every museum in the world to sell off pieces? The Church’s status because of its majesty, raises much more money for the poor than selling assets one time. Besides, who would buy them? Where would that money come from and end up? I don’t know. Am I missing something here? Every time I hear this argument about the Church should sell her treasures to feed the poor, a huge question pops up in my head; and I would say: OK, so the Church sells her treasures, raises xyz number of dollars, and finally spends the xyz number of dollars to feed the poor; then what???????? What would the Church have to sell after that to feed the poor????? STEVE RAY HERE: I would have to disagree with this comment below and most of the assertions made. I think there are in accuracies in the statements and miss information as well. These gifts have been given to the Vatican is a sacred trust in the Vatican has responsibility to keep them for the church in the world of the future. I might suggest that we put the pressure of protestant churches to sell their properties and treasures and all of the things that they own including some of the ministers with multimillion dollar states. Why is it always the Catholic to get pointed to know whenever suggests the Muslims for the Protestants are other groups. Mormons are vastly wealthy. But I do disagree thoroughly with this comment but I put it up for the sake of discussion. It seems to be that everyone addresses this question with an "all or nothing" response when, in fact, I think there is middle ground. I have read that of all the 70,000 art treasures housed in the various Vatican museums, only about 20,000 are actually on display. Now, perhaps there is some movement of artwork into and out of storage and, of course, some pieces may be greatly valued and others not so greatly valued. But, if 75% of its artwork is in storage at any given time, some of it could be sold. Now, I think it rather "unthinking" to argue that none of this artwork could be sold because of international law. I suspect that, if the Vatican put up a sound argument for a limited sale of some of its artwork, and it were done in a way to benefit the public, the Vatican would have international support. For the person who argues that such valuable art should not sit in the private homes of only the wealthy, there are many art museums who would have an interest in such artwork for display in national galleries around the world. Then, there is the argument that you could never feed the poor through such a sale. Agree, but the Vatican could make a dent, and what about the thousands who have suffered from priest abuse. Perhaps there is a way to contribute there. Again, the amount would be small, but the gesture great. Of course, it is not only the Vatican in the whole of the church that has stored wealth of art treasures. Think of the gold and gems that adorn many of the cathedrals in the world. No. don't sell the cathedral or all of the riches, but some of what we see when we walk through the doors of these great churches was built on the backs of the poor who died in these creations of these sites. I am not saying sell off the church. What I am saying is why does it have to be an "all or nothing" proposition? I hope Pope Francis will strike a proper balance. If, the Church were to sell all of it’s assets and give 100 % to the poor. The Church would be broke and the poor would still be poor. The concept is IGNORANT. You can help the poor with a helping hand , it is called equality of opportunity not equality of outcome. STEVE RAY HERE: I am allowing this comment to show up on my blog to give proof of how confused people are about the Vatican, even Catholics! The arguments presented below have been answered over and over again and it’s obvious he/she didn’t read my article very carefully. The spelling and grammar is atrocious and makes me wonder how intelligent this person even is. I don’t mean to demeanor a person because of their spelling (because spelling is not my forte) but it certainly does indicate something. Read the words below with caution but realize the confusion that is demonstrated here. I wish the Catholic Church was better at promoting itself but like Jesus it just is silent on most of these things and it’s up to us laypeople to explain them. Reagding the Catholic church's "wealth" ; I have this to say. Actually several things. I am a practicing Catholic and belive many of my church's teachings, but certainly not all of them. 1) Christ and the Apostles lived a very meagre life. They made no effort to accumulate wealth realizing that was not what God wanted. I'm sure any gifts given to Christ and his disciples were not kept but in fact used to further their missionary work, help the poor etc. 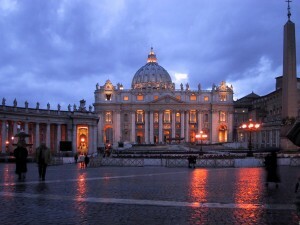 2) The Vatican has billions in assets consisting of real estate, priceless art treasures, an investment account , etc. To imply that the Vatican has no material wealth is nonsense. 3) The argument that the Vatican's art treasures belong to humanity and cannot be converted into capital is one of many confusing and misleading arguments used by the church to justify not selling them. If Christ and the 12 apostles were either given art treasurers or had them commissioned to be made, I doubt they would have been held on to . Th primary mssion of the church is is evangelization and discipleship. All assets accumulated and not needed to run the overall church's administrative needs should be employed to help people in need, to bring people to Christ, and for his greater glory. 4) Show me legally, and even rationally, that the trteasures in the vatican cannot be sold and capital raised. Show me the legal documents which show that they belong to the Italian state. Hogwash. They belong to where they were given in the first place. 5) The argument that humanity would never again be able to see these priceless trasures agin is not valid. A team of professionals such as Sotheby's and others could scrupulously control who wins the bids and purchases the treaures. Conditions could be applied to the sales. 6) The argument that this would only generate wealth to help the poor for a limited time also does not hold water. I believe that literally billions could be raised selling off even a small percentage of these art treasurers. Art works such as the Pietsa, and real erstate inetgral to the existance of the Church and the Holy See would not be sold. The billions raised in such a sale would go into a professionally designed investment portfolio managed by several of the top , reputable wealth managers in the world. Several banks for instance would have a portion of the assets to be managed. The revenue from the total portfolio would be used to fund the annual administartion costs of the Vatican and for various charitable works globally decided upon by an independent board.This means tha fgunds would be availble annually , potentially ,for generations. In spite of Pope Francis' dedicated and commendable efforts to decrease and control the costs of running the Holy See, deficts still continue in most years. Such a portfolio would alliviate that prtoblem. I was in the investmnent industry as an advisor for 30 years. This would work. Many Catholics would not embrace the sale of any part of the Vatican's priceless art treasurers but it is not their wiashes which matter and technically they have no say on the subject. It is God's wishes and what Christ envisoned when he established the church. Billions in priceless art treasures was never part of the plan. I believe God looks on the church today and shakes his head. Thank you for opening up this venue and being fair in showing both sides . I was a devout Catholic for many years.Felt compelled to leave for several reasons ,the last being the subordinate treatment of women in the church. They are allowed to do housekeeping chores, office work ,but not much beyond that. and see the Jewels and art treasures stored by the Vatican?I think they were be horrified and outraged. There mission was to look after the poor the hungry ,the disadvantaged,not to accumulate wealth. I am praying for change. I agree with Corson Lane where there is a will there is a way,roadblocks can be overcome. Though I disagree with Denise I certainly appreciate her gentle tone and willingness to share her thoughts openly on my blog. Thanks! Even though I disagree I am allowing the post for the purpose of discussion. However I must say that I think the reasons for leaving the church that Jesus started 2000 years ago ate inadequate. I also find her reasoning flawed. Sorry I did not have time to address the issue she mentioned that maybe someone else.